Despite at least 45 people being killed by security forces, tens of thousands of people across Sudan have been peacefully protesting against the rule of President Omar Al Bashir, who has ruled the country for 30 years. The protests started in mid-December in Atbara, a city in River Nile state, about 180 miles from Khartoum, as a spontaneous reaction to rising prices after Al Bashir’s decision to end fuel and wheat subsidies, following the recommendations of the International Monetary Fund. When the protests broke out, inflation in Sudan had soared to 72.94 per cent the second highest rate in the world after Venezuela. Al Bashir and his government have repeatedly blamed inflation and economic deterioration in the country on the economic sanctions imposed by the United States in 1997. The Trump administration removed the sanctions in October 2017, but contrary to the Sudanese hopes of improved economic conditions, inflation increased and the economy deteriorated further. The government followed the IMF recommendations to remove wheat and fuel subsidies and devalue the Sudanese pound. The impact was felt by the vast majority of the poor, especially as the government had failed to implement the IMF’s recommendations to use funds from the African Development Bank and the World Bank to support vulnerable families. The Sudanese economy had already been struggling with the loss of 75pc of its oil revenues with the secession of South Sudan. Most of Sudan’s national budget goes to the military and security sector, as the country is dealing with insurgencies in the South Kordofan, Darfur and Blue Nile regions. In 2018, only 3pc of the national budget was allocated to education and even less to health. The salaries and allowances of national and state government officials put more burden on the annual budget. The country is crippled by corruption — Sudan ranks 175 out of 180 countries on Transparency International’s Corruption Perception Index. The spontaneous protests soon began to be organised and the rallying cry became a demand for an end to Al Bashir’s rule. Doctors, engineers and university professors came together under the banner of the Sudanese Professionals Association and organised the protests. They found support from Sudan’s Call, the largest opposition bloc, and the National Consensus Forces Alliance, the other major opposition group, which asked its members to join the protests and demanded that Al Bashir step down. Al Bashir’s history of oppression and economic mismanagement ensured that protests weren’t limited to Khartoum but were spread across the country, even in marginalised peripheries like Gadarif in eastern Sudan and Nyala and El Fasher in Darfur, where the regime has allegedly killed thousands of people and destroyed hundreds of villages in counterinsurgency. The continuity, spread and growth of the protests, despite the violent response of Al Bashir’s government, have surprised both the government and the Sudanese opposition. We are witnessing the longest and strongest protests in Sudan’s post-colonial history. Although Al Bashir has a firm grip on the state, and global pressure following the violent repression of protesters has been weak, the protests have broken new ground by emboldening the Sudanese to confront religious leaders and institutions that attempted to discourage people from protesting. 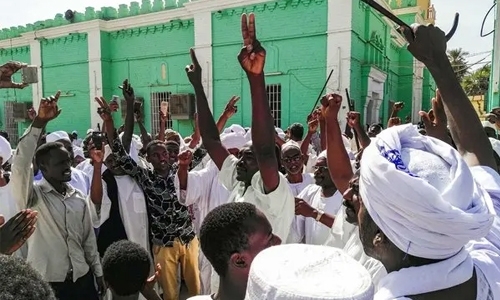 While these religious leaders tried to use religion to garner support for Al Bashir during their Friday sermons, the attendees at the mosques — tired of the dire conditions in Sudan — responded with unprecedented protests inside the mosques. On Dec 21, an imam at the Al Yaqeen Mosque in the Bahri area of north Khartoum argued that the prices were rising because of people’s moral turpitude. Before completing his argument, the people gathered for prayers at the mosque objected and insisted that the imam should get off the pulpit. They forced him to leave the mosque. A week later, Al Bashir was attending Friday prayers at a mosque in Khartoum and worshippers chanted slogans asking him to step down. Al Bashir left the mosque. The protests have also created a tenuous unity in the ethnically and regionally divided Sudanese society. Maj Gen Salah Abdallah, the director of the notorious Sudan Intelligence and Security Service, tried to use a divisive strategy to break the momentum of the protests. Abdallah blamed the Sudan Liberation Movement, a non-Arab rebel group from Darfur, which has been fighting against Al Bashir’s government, for burning the offices of the ruling National Congress Party. But the protesters in Khartoum responded by chanting, “The entire country is Darfur.” The divisive gambit failed because the protests are about desperate economic conditions and authoritarian rule across the country, not unresolved political problems in Darfur. And despite historical ethnic and regional divisions in Sudan, the drivers and the leaders of the protests are millennials, who seem to have decided to rise above the regional and ethnic dichotomies of their society. More than 60pc of Sudan’s population is under 25 and around 20pc is between 15 and 24 years old. During the long conflict between southern Sudan and northern Sudan, religion (Christianity versus Islam), ethnicity (Arab versus non-Arab), and regionalism (south versus north) were used by different Khartoum governments to mobilise people against southern Sudan. No popular opposition to the politics of division emerged and southern Sudan eventually seceded in 2011. Young Sudanese seem to have understood that when citizens do not publicly oppose the use of ethnicity, religion or regionalism by politicians, the entire country pays the price. Putin’s next playground or the EU’s last moral stand?